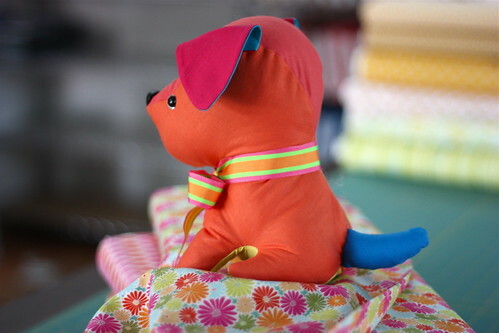 Welcome to Week 40 of the One Yard Wonders Sew Along! Jacqui chose Solids Color Stack July – Cabana. When attaching the head gusset to the body, Jacqui found it easier to only sew one side at a time – from the nose to the back. She used the same technique when attaching the tummy to the body. Sewing each side starting from the front of the body to the back. This little pup has a heavy head and tends to tip to the front. Jacqui recommends adding some weight to the bum to weight it down. In step 2 the book suggests placing a pipe cleaner in the tail. Jacqui used a lot of stuffing to make the tail stand up. 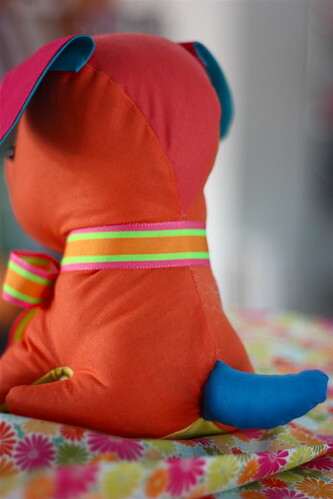 A plastic nose was used instead of embroidering one. Jacqui found the eyes and nose at Carols’s Zoo, carolszoo.com. 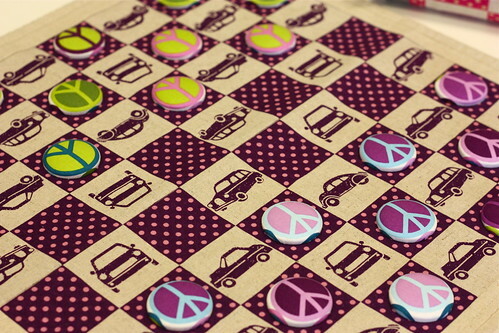 Kathy will need 24 flat backed buttons to use for the checkers. If you would like to order the Pink Chalk Covered Button Kit – Magnet Back – 20 Buttons to make checkers please let us know on your order that you are making the One Yard Wonders project and we will send you the extra 4 buttons. Kathy loved the concept of a fabric checkerboard. 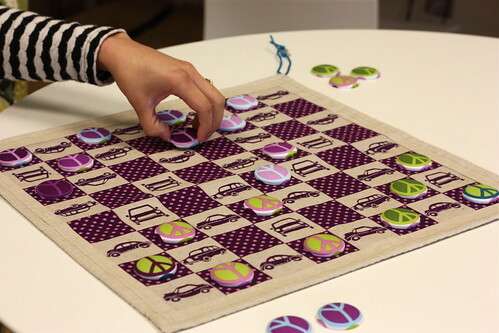 She simplified the construction by using fabric with pre-printed squares for the board and substituted large covered buttons with flat backs for the checkers. This was a good match for her last-minute style of sewing. 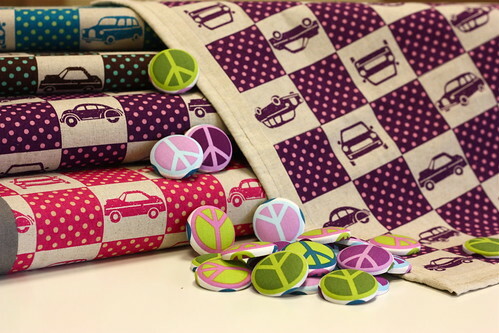 The Echino Car Box fabric was directional. In order to have cars that faced each player, Kathy cut out two sections that each contained 8 squares across and 4 squares down. She left a 1/2” seam allowance at the top of both pieces, lined them up, and sewed them together. Kathy added a 2” border to her checkerboard using Robert Kaufman Essex Linen. 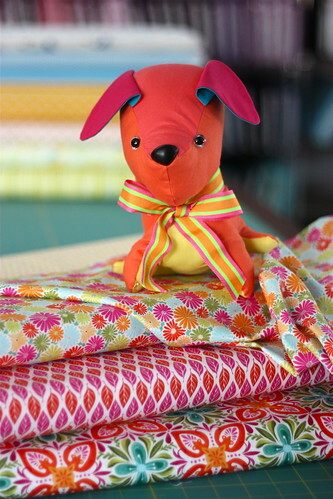 When adding a border, remember to add a seam allowance when cutting your checkerboard fabric. The instructions are silent on how to fold the fabric corners to create the casing. In order to thread the cord all the way around, fold each corner of fabric in diagonally before folding under each edge to form the casing. This will create 4 casing channels, one on each of the 4 sides, with openings at every corner. Kathy found the cording did not easily cinch the entire checkerboard into a bag shape. She used a cotton/linen blend fabric which was more stiff than a quilting cotton. Next time she would create a simple drawstring bag from the checkerboard fabric to store both the folded up board and the checkers.